I’ve been blogging since 2004, and since 2005 at my site Booman Tribune. Actually, most of the denizens of the blogosphere know me as “BooMan.” I’ve never really been fully pseudonymous though. When I created an account at Daily Kos in March 2004, I had to choose a user name, and I chose the nickname I used for my 140lb. Newfoundland dog. Since I quickly developed a following there, when I created my own site, I decided to stick with the name I had become known for. It was more a marketing thing than a desire to disguise my identity. Still, because I didn’t advertise my name, few people realized that I was the brother of the Washington Monthly’s Senior Editor, Phillip Longman. Like Phillip and our brother Andrew, I majored in philosophy in college, so you can imagine what the dinner conversation was like. Making it worse, unlike my older brothers, I spent my entire childhood in Princeton, New Jersey, surrounded by egghead intellectuals. In 2004, though, I decided to work for Project Vote and took a job as the county coordinator for Delaware County and (later) Montgomery County, Pennsylvania voter registration and get out the vote drives. In other words, I became a community organizer for the dreaded ACORN. In that role, I worked with inner city young adults from North Philadelphia, and this experience definitely has informed my entire blogging career. If you are interested, I have written about my experiences at ACORN many times, although this seems like one of the best places to start. I think the point of pieces like this is to give you some idea of where I am coming from and what you should expect, and I don’t know that I’m very good at telling you that kind of thing. So, I asked my readers (many of whom have known me or been reading me for more than a decade now) how they would describe me and my writing. As of right now, there are 21 comments in the resulting thread, and I think they’ll give you a better idea of what I’m like than anything I could say. A couple of years ago, I agreed to do some weekend blogging for Political Animal, and then I took a job as the web editor here when Ryan Cooper moved to greener pastures. So far, it’s been a great experience working with Ed, getting to interact with Phil more than I did in the past, and receiving some much needed and valuable mentoring from our excellent editor in chief Paul Glastris. It’s a honor to fill the shoes in whatever small way I can of blogging giants like Kevin Drum, Steve Benen and Ed Kilgore. And it’s always a pleasure to work with Nancy LeTourneau who I have admired since she posted her very first blog post on my site many years ago. It’s hard to say what I’ll focus on here. One thing Ed and I agreed passionately about is that the biggest political problem we’re facing as a country right now is the transformation of the Republican Party into a nihilistic organization that won’t negotiate in good faith. One of my strengths is explaining Congressional procedure, but there isn’t any procedure to explain at the moment because Congress doesn’t pass much legislation. That presents a problem not just for me, but for everyone who wants to focus on policy and problem solving. 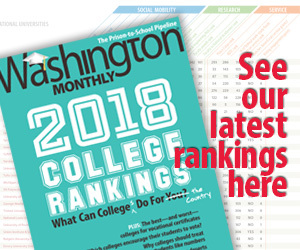 And the Washington Monthly is dedicated to good government and aspires to be a laboratory for good and innovative ideas. I hope we have more chances to see those ideas taken up by legislators in the near future, but right now we’re forced to deal with debates about whether Donald Trump or Ted Cruz would be a better president. We’ll have plenty to talk about over the next year as we figure out who our next president will be, but I kind of doubt too much of it will be high-minded and uplifting. Perhaps I can help explain the arcana of the party nominating rules. If things break the right way next November, though, we might get a chance to talk again about how a bill becomes a law. I’m hopeful. In any case, I’m happy to be here. I hope that we’ll have some fun together as I document the atrocities.